u maek me get in wadders an faes teh kwinsykonsiz! Knot two worri kitteh. U don getz eet, ai promize. Conga costumed kitten. Ohai.thx an g’nite noodle.Ai need a nerlee nite! Sooo…. I talked daonstairs naybur intu sittin owtside wif me wif candy (is security bilding, cannawt duz indoors). Then I fawled asleep fur a nap an had tu scramblol tu get into teh rest of my tuxie-kitty costume (I RLY like lolloween, what can I say?) an get fings set up outside. We freezed fur a whylol saw 2 kids tugevver, chatted wif a few nayburs, then dragged cold selves back in. Finkso naybur rite, this nawt a narea that it am wurf tryin to do teh trick-or-treets. Oh well! Anyway, is why I vanished. I are hongry nao, Jackie gonna feeds me supper an I gonna reluctantly get out of tuxie-kitty costume an go back tu bein hyoomin (pleh). I furgotted to say, yesterday were tuxie-Trick’s 13-year anniversary of showin up at our door!!!! Fankies ebreewun who were around today bein part of fings, at any point! Lubs you guys muchly, I duz!!!!! Adn we thanks _you_ for hosting owr Lollowe’en fun, Prysma adn Jackie adn all! 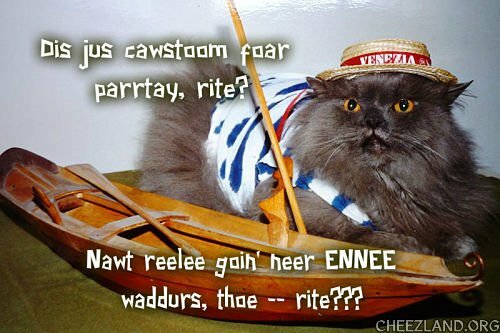 How do kittehs manaje to get arownd in Veniss? All teh streets are wet.